Saw painterly added a bunch of new textures for 1.6 and Wild Grass so added a bunch of new decorative blocks while I was waiting for my car's tires to be rotated and oil changed. Added hurtTime-, hurtTimeResistance-, and heldItem-related methods to scriptEntityLiving. Fixes eggs, fireballs, and snowballs so they can push through clip blocks. Added ScriptEntityMob with attackStrength methods. Thanks for my wool, im so happy.. snif. Damn you didn't update to 1.6.6 yet, did ya? I updated to 1.6.6 over a week ago. You need to download a new version with a new launcher for it to work with 1.6.6.
oooohhh mah gosh. Are there any alternate textures for the side grass? I'd like to be able to reskin that little bit without reskinning all of the side grass. Well, clearly there aren't any in-game, but I mean, painterly has some, doesn't it? 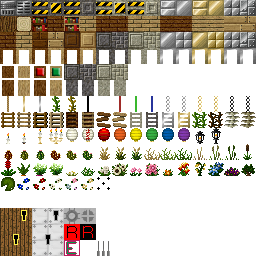 Maybe you could just the default grass as a reskinnable alt texture for each alt texture of grass.